Our loved ones are given to us on loan , to love and care for until it is time for them to go. Stella with her Bernese brother, Ranger. 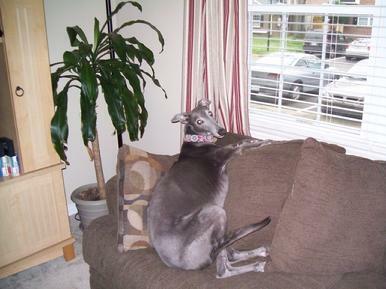 Stella, our first Greyhound, came to live with us on July 31, 2011. Upon arrival, she immediately picked our youngest son as HER person and that bond only got stronger over the years. Stella was a diva and so unbelievably cat-like, which she would never admit given her intolerance of all things feline. We didn’t “own” Stella; we served Stella. That was no point in trying to convince her to go for a walk because she was far too sophisticated to be led around on a leash. Instead, she would come and tell us when she wanted us to take her for a walk, always on her terms. Her first three years were spent sharing space with a Bernese Mountain Dog more than twice her size, who was happy to let her run the show. She would steal his toys and take them to her bed. 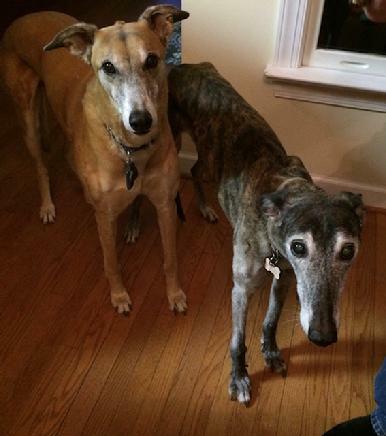 After we lost him in 2014, she seemed a little lonely, so we adopted our second Greyhound—a male who was a year younger and much larger. They settled into a comfy relationship of the bossy big sister and the obnoxious little brother. She taught him how to jump in and out of the back of my Subaru, for which I was eternally grateful as he was much too large to pick up myself. She enjoyed laying in the grass out in the sun and she often made us laugh. We loved serving her right up to her last day on June 6, 2018, when she lost her battle with osteosarcoma. She was indeed a queen and we will always be thankful for the time we had with her. Our sweet girl, Amber, passed over the rainbow bridge on 2/19/18 where we are sure Chase was waiting on her and wanting to play and run. 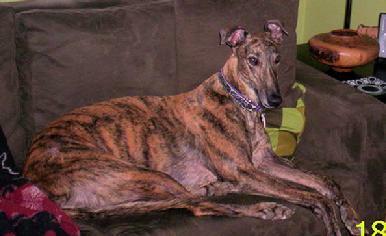 We adopted Amber in 2006 and she was our first Greyhound. Of course, we fell in love with her and adopted Chase a few months later. They both brought many laughs and lots of love to our household. Everybody who met them, fell in love with both of them. RIP Amber and Chase. You will always have a special place in our hearts! Miss you and love you both. Our Max crossed over the Rainbow Bridge on October 26 to join his sister Lily who had passed fourteen months earlier. Max loved to dig holes in the back yard and sit on our bed and gaze out the window. He quickly learned that when a car passed, it might be Mommy or Daddy coming home and he would run to the door in happy anticipation. Going bye bye was a real treat for him. But most of all, he loved having a home and being part of a family. Max loved us dearly, and we loved him with all our hearts. 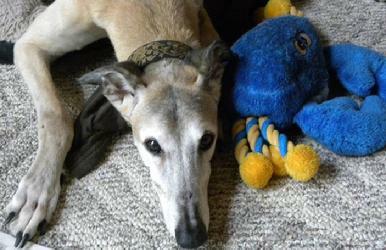 You rescue a greyhound; he rescues you. Max was only seven years old when he passed. Our beloved Lily crossed the rainbow bridge on August 31, 2015. At less than nine years her life was a short one. But in the brief five years she shared with us, she gave us great joy. 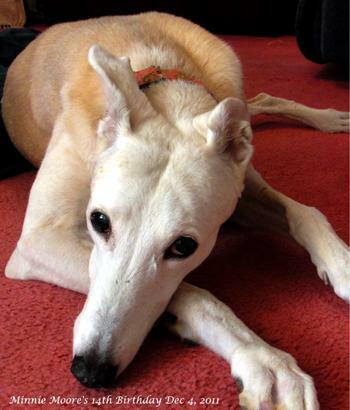 Lily had an irrepressible personality, touching many lives, making friends wherever she went. She is fondly remembered by her parents, neighbors, and friends. We are heartbroken to have lost her, but grateful that she was part of our lives for those brief five years. Lily, we will never stop loving you. Sleep well Sweetheart. Maya came to us as a joyful creature, with an impish perpetual smile. Covered in racing scars, balding spots and a broken tail, her spirit proved far more beautiful than any outward appearance could ever convey. During those first months, our "pretty, pretty, princess" easily stole our mail, our kleenex, our socks, and our hearts. It was quite clear who rescued who. We are so incredibly grateful to have spent the past eight years as her forever family, and even though we grieve for her now, we will always be blessed with beautiful memories that remain etched upon our hearts. 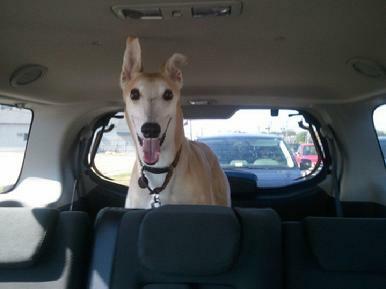 Bogie loved to go for rides and you can tell by his giant smile. He was 11 years old when he passed. 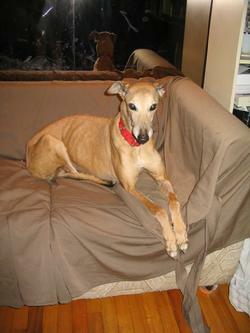 He had some super incredible greyhound skills such as sitting and he also had the softest fur possible. I used to tell people he had won awards for the softest fur on a dog. They always said, "Really??" and I would reply laughing and tell them that I was lying but I'm sure he could win an award. Bogie loved to get hugs around his long neck and as we know, he was a little cry baby when he didn't get the attention he so deserved. I miss that boy! He wanted you to be where you should be and no changes PLEASE! Harley had a way of reading you. When you were upset he would watch you with his serious eyes and before you knew it he was at your side. Giving him his daily massage helped us feel better. 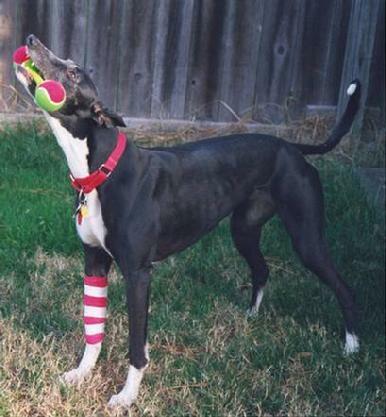 Harley loved to run in the yard and was all greyhound doing it. He was an expert beggar and always got a piece of what we were eating. His eyes could tease the last bite off your plate. He left us at 11 years old but gave us the wisdom of the ages. We miss you sweet boy and can not wait to see you again. "Our hearts are broken. Our beautiful girl is gone. Minnie had just celebrated her 14th birthday on December 4, 2011, by the grace of God. 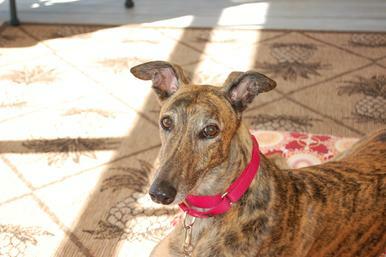 Gay, you brought her to us 11 1/2 years ago, and she brought with her joy, laughter, love, and opened the way for a few more Greyhounds over the years to come into our home. Minnie was beautiful the day we adopted her and beautiful the day she left us. Thank you, Gay, for all those years ago when you said to us "they've got this fawn female up in Philly who likes to give kisses." She gave a lot of those kisses over the years, and we treasure every one. Minnie Moore 12/4/1997-1/23/2012. Blaze crossed the Rainbow Bridge on July 26th at 11 years young. She was a very sweet girl who was loved by Jan & Ken Sateren. She will be missed. Strider (aka Spider Man) crossed the Rainbow Bridge on August 7th at the young age of 13. He loved his blue crab stuffie and was also so cute when he sang Happy Birthday! Strider was much loved by Sam & Gay Latimer and will be missed. 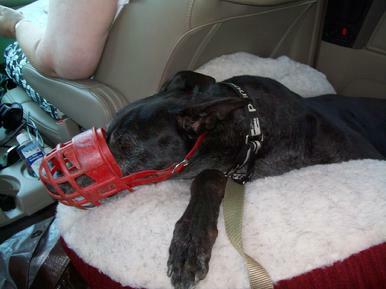 Maggie was a sweet 13 year old who was rescued from a terrible situation in North Carolina. Word went out about her plight and two wonderful people, Donna & Steve Cluett, stepped forward to bring her into their home. 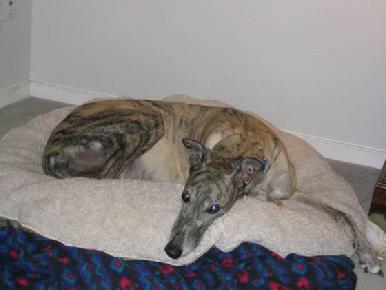 She spent the last few months of her life being loved and cared for by Donna & Steve along with their other two greys Reba and Tori. Thank you to Donna and Steve for opening up their home and their hearts to Maggie. Surveying his kingdom, Rowdy spent many hours on the couch looking out the window checking out anything that moved! 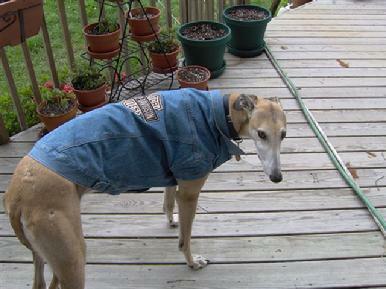 Only 8 years young, Rowdy was loved by the McQuagge family and had a wonderful life. 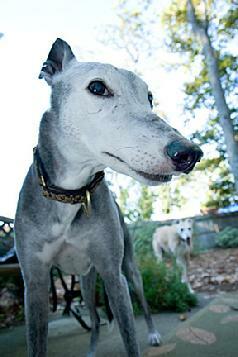 He brought much joy to our lives and will be missed not only by us but also by his greyhound sister Tracy. Sonny went to the rainbow bridge January 2008. He was 10 years old. He loved people and loved for people to pet and/or hug him. His nickname was "Sonny Bunny" or more simply "Bun" due to his habit of raising one ear straight up in the air and half cocking the other. 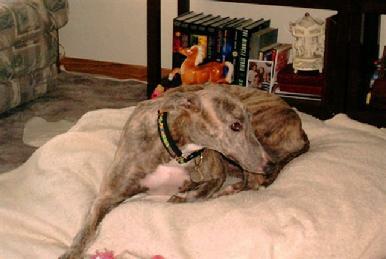 He loved running in the yard with his greyhound siblings and resting/roaching on his napper. Luke, Nov 1997 to July 2008. Luke remains a treasured member of his family. A beautiful white boy with blue patches, he was a fantastic meet and greeter. He loved his monthly visits to Petsmart and could never imagine that someone wouldn't want to love on him. He had an amazing ability to intercept people who tried to walk by him and initiated a lean sequence to prevent them from getting away. 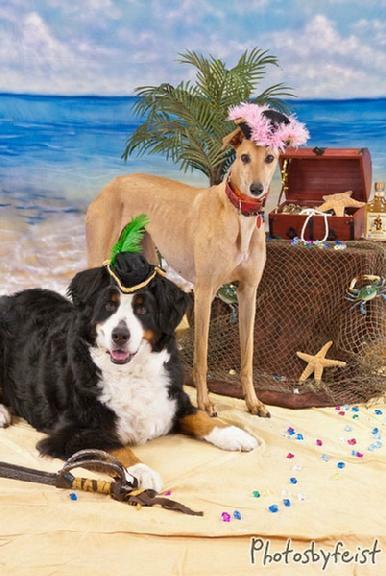 There will never be a better counter surfer and treat scrounger. 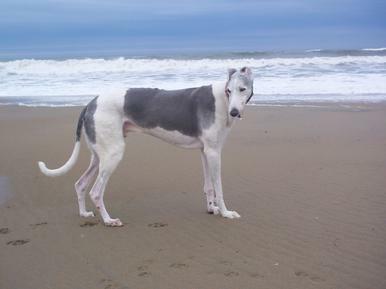 His favorite place of all was the beach and you could see him "smile" as he trotted through the waves. 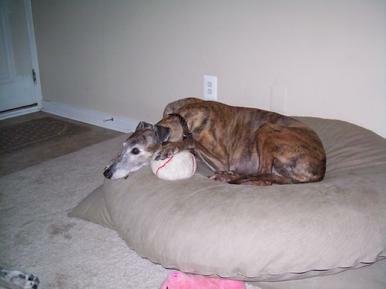 He is loved and missed by his greyhound brother Chipper and pug sister Yoda. 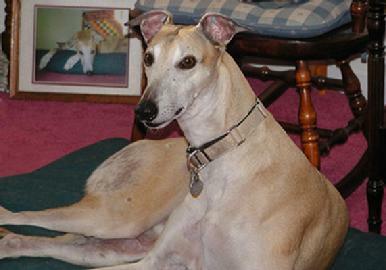 of 11 years, Casey, who died February �08 at age 14. We are devastated but glad we had the chance to love and live with the sweetest dog I've ever known. The whole town of Cape Charles is in morning and she is missed so very much. She brought so much joy not only to me but to everyone she touched. I will always have wonderful memories of her. Although I had him for only a very short time, he was loved as though he'd been here forever. A big, goofy guy, Baron filled my heart with joy and I will miss him very much. He has crossed the Rainbow Bridge and was met on the other side by Rowdy. They are both now free to run and chase all the rabbits they can find. 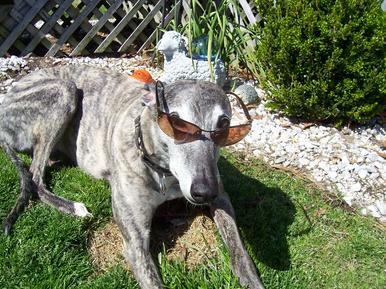 Romie was almost 13 years young when he crossed the Rainbow Bridge. He was loved very much by the Deninno family and will be greytly missed. Dean was a beautiful, black boy who passed at the age of 12 from Lukemia. He had been returned to the kennel and was adopted by Ms. Ann Barr who gave him a wonderful and loving home for the last few months of his life. He was much loved and will be missed by all who knew him. Dolly passed away at the "young" age of 14. She was loved and will be missed by Claire Carbone. He enriched each and every day for over 12 years. When we started our journey 12 years ago; I thought I had rescued him. Now that he has gone over to the "rainbow bridge" I realize it was "Treat" who rescued me. God bless you and the work you do. 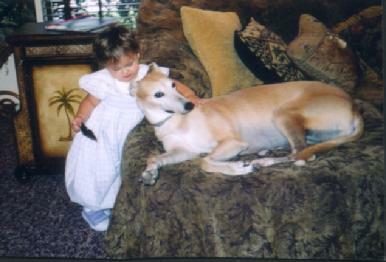 Lady was the definition of unconditional love. She loved everyone that she ever met and let them know it. I have never experienced anything close to the pain that I feel in my heart now that she is gone. Its very strange walking around my home without my extra shadow. Lady would follow me everywhere I went while I was home. Lady was the perfect dog! Joanne and I tried our best to think back to any one time that she was mean to anyone and could not think of any. She loved anyone and anything (except squirrels, rabbits and birds in the back yard). We miss her at every turn in the house and will always smile when we think about how goofy she could be at times. We are so thankful for our short time with her. One six year old neighbor told me that she is probably in heaven chasing Elvis cause he is up there too! She was one of a kind and we were so privileged to have had her with us for 9+ years. Everyone that met her seemed to love her�and she made sure everyone met her by leaning her body into theirs or by spanking them with her happy, whip-like tail. She�ll be deeply missed. 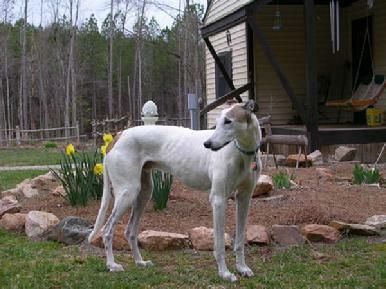 Toby crossed the Rainbow Bridge in August 2009 and was met by his "sister" Casey. He was loved by Betty Ward and will be missed very much. I love this big smile and those floppy ears. Have you ever seen a happier dog? Tyler came from Florida and this was his first snow. He found joy in everything he did and he brought me great joy for the short time he was with me. Tyler crossed the rainbow bridge July 2009 and is probably up there with his older brother Jigo telling stories about those darn cats Mom insists on keeping around the house. Khaki was loved by the Church family and will be missed. I didn't have to think twice when naming Chipper. He was the most purely happy boy I've ever met with a tail that refused to stop wagging. He was a friend to everyone, and was remembered by all he met for his super stinky breath that nothing could cure! 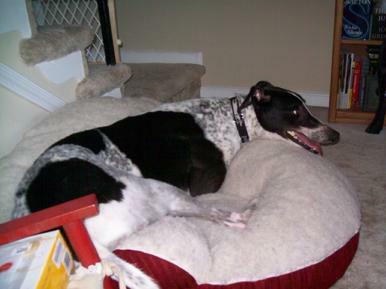 A racer, and a then a blood donor, he wasn't sure what to think of a home when he arrived, but he knew how to make us laugh. Always full of surprises, he finally learned how to climb stairs when he was 11.5 years old. He taught me that the simplest things are really the best: a nice walk, a good bed, and loving heart. He left this world at 12.5 years old to join his brother Luke. He is missed by his family and his puggy sister Yoda. On January 4th at the young age of 13 1/2, Tracy went to the Rainbow Bridge. She ruled the house and made sure everyone knew it. Now she is on the other side with Rowdy and Baron and I'm sure she is still in charge! She was much loved and will be greytly missed by Ranger and me. Sunny came to us as a foster dog, well we fail the foster parent program. We received a call after 2 weeks of havng her and was notified that a home had been located for Sunny and thats when we notified the caller that they sure had located a new home for her, right where she was. Sunny brought us lots of laughs and smiles as we taught her how to talk and she responded. It broke our hearts to learn she was sick and we were soon to part with her. But all the way up to the end she was a trooper never giving in to her illness and striving forward. Chad, my big handsome boy with the beautiful hazel eyes, passed on August 1st. Too soon and sudden, we will always miss him.